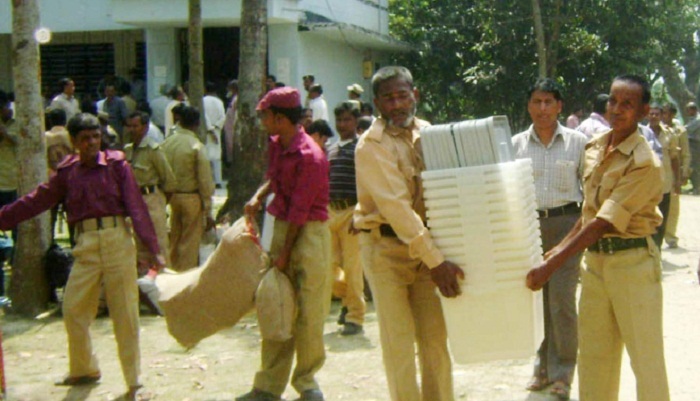 The Jatiya Party has provided the Election Commission (EC) with a list of 1500 vulnerable polling stations and demanded adequate security measures be taken for the vulnerable polling centres. The party also demanded the deployment of a magistrate to curb election violence and irregularities in the vulnerable polling station, according to presidium member SM Foysal, UNB reports. However, according to the EC Secretariat, the number of vulnerable polling stations is 1184 out of 3403 across the 233 municipalities witnessing elections. As ballot is not required in Parshuram municipality, where all the mayor and councilor posts have been filled unopposed, the votes will be cast in 233 municipalities on December 30. Of the 1184 vulnerable centres, 348 out of 991 in Dhaka Division, 118 out of 304 in Rangpur, 246 out of 801 in Rajshahi, 195 out of 471 in Khulna, 45 out of 189 in Sylhet, 63 out of 167 in Barisal and 169 out of 480 in Chittagong. SM Foysal on Thursday alleged that ruling party men are carrying out attacks and harassing Jatiya Party’s candidates and activists ahead of the December 30 municipal election. Kazi Rakibuddin Ahmad at the EC Secretariat. He said they raised some specific complaints at the meeting and the CEC assured them of taking steps regarding their allegations.